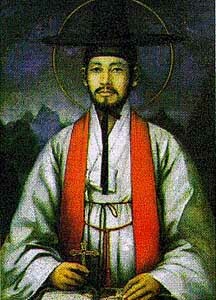 The first native Korean Catholic priest, Andrew Kim Taegon, was martyred for his faith on this date in 1846. Catholicism had begun making inroads in Korea from the late 18th century, a development most unwelcome for the Confucian Joseon dynasty. Catholic adherents graduated over the decades of the 19th century to heavier and heavier degrees of persecution. By 1866, the peak of anti-Catholic sentiment, it’s thought that Korea’s Catholic community numbered about 20,000 living souls — and had lost about 10,000 others to martyrdom. Andrew’s father was one of these 10,000. The son, and the principal figure of this post, was baptized in his childhood. 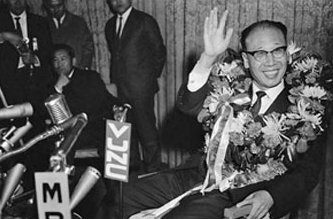 He trained for Holy Orders at overseas seminaries, in China and the Philippines (according to Wikipedia, he has a statue in the Philippines village where he once hung his hat), finally stealing illicitly into Korea to evangelize underground. Such missions were of ancient vintage for the Church; they have also proven a font of martyrs. Kim managed about 13 months before he was captured and put to death in the 1846 “Pyong-o persecution”, one of several distinct crackdowns on the alien faith whose episodes punctuated the overall fearful climate for Korea’s Catholics. Beheaded at the age of 25 among a group of 20 Catholic martyrs, the young man was eventually canonized as St. Andrew Kim Taegon by Pope John Paul II. He shares a common September 20 feast date with other Korean martyrs, including Paul Chong Hasang. St. Andrew is the patron of the Korean clergy, and of the Pontifical Korean College in Rome. When in Seoul, stop at the Jeoldu-san museum and shrine to remember him.